There is something about windows and reflections that really fascinate. However, sometimes the windows that don't reflect become even more fascinating. Dette var RÅTT, for å bruke hennes uttrykk. Virkelig flott! En hel collage... i ett eneste bilde. Spennende. Man kan nesten ikke se seg mett... Veldig bra! Now, there's a new thought!...windows that don't reflect...and it's quite a collection! Oh yes, I see what you mean! Very interesting & thought provoking photo. That is a brilliant composition. I like the contrast between the reflective and non-reflective panes. I do agree with you, Rune, these are fascinating indeed! 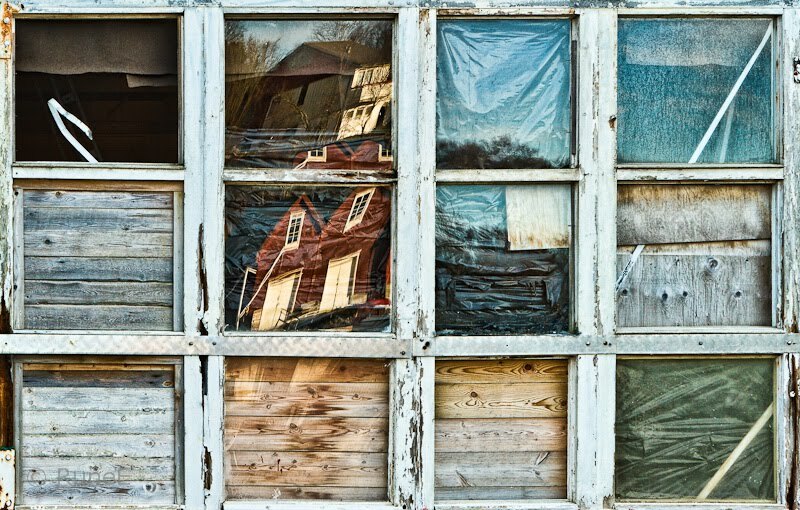 What a great collection of windows you have captured! Terrific composition indeed! Hope you have a wonderful weekend! Et stilig bilde, - bilder i bildet! oh oh oh I love this! Incredible. You are back to killing me ....thank you! but how did you do that? I agree, either looking out or looking in, windows are fascinating. I love those textures and colours in this shot. And if finally, the most interesting window was the one which is nor closed neither reflecting?..The one on the left corner, is like a dark hole, very attractive and very mysterious...It does show the inside, it does not show the outside, it does not show anything..
That's great! Have just been having a brief trawk through your recent posts. I'll be back! Windows that don't reflect read, like that sign in front of Xanadu, "No trespassing." Fytti katta, rått bilde, Rune! PS! Ordbekreftelsen er helt sykt vanskelig å tyde! For me it's the variety that makes this unusual and interesting. I'm trying to figure out how you did it. It's getting late here--maybe I'm just tired. But thanks for another good photo. Well, I must say I have never seen anything like this. I am quite mystified as to how you did this, Rune, but then as you know, I am NOT a photographer. But, since I really find this fascinating, you must know that even though I know nothing about this art, I love love love looking at it. There are just so many small things to see and ponder. Thanks again for a great blog. What a fabulous photo! Is that one frame with twelve panes in? It is so captivating. Rune, as I have mentioned before, I love your window photos and the word that comes to mind for this one is delicious. I do not want to eat them, but they contain so many fine ingredients presented in such an appealing way. Sorry to be absent of late (again) & thank you for removing that nasty word verification.